Employing a new technology, MIT engineers have studied the origins of a mass gathering of hundreds of millions of fish and their subsequent migration. This is the first time a mass migration of animals has been studied from beginning to end, according to their paper published in Science. Until now biologists have depended on theory rather than data from the field, employing computer simulations and experiments in the lab. Studying Atlantic herring near Boston, the MIT scientists found that when the fish gathering reached a certain density it caused a sudden synchronization of movement, where upon hundreds of millions of individuals began to act as though they were one. Such massive groupings can extend for 25 miles (40 kilometers) over the ocean. receiver. Image courtesy of Nicholas Makris. “As far as we know, this is the first time we’ve quantified this behavior in nature and over such a huge ecosystem,” said Dr. Nicholas Makris, head of the study and professor of mechanical and ocean engineering at MIT. The study also highlighted that the massing of the herring occurred at set times. In the evening the fish would swarm together in order to swim to shallow water to spawn. The next morning they would return together in another mass migration to deeper waters where the massive group would disintegrate, allowing individuals to go their own way. 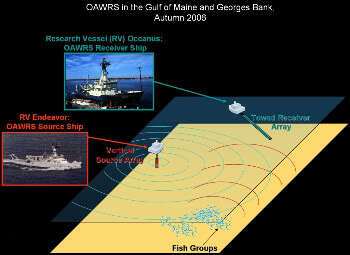 The MIT engineers employed a new technology, Ocean Acoustic Waveguide Remote Sensing (OAWRS), to record the mass migrations in detail. Developed by Makris and his team in 2006, the OAWRS is able to take images of an area 62 miles (100 kilometers) in diameter every 75 seconds. The system relies on sending sound waves that locate objects by bouncing off of them. By employing sound waves with low frequency, OWARS send them further than similar systems. The inventors hope that OAWRS could be employed to aid fish conservation. “OAWRS allows us to gather information such as geographical distributions, abundance and behavior of fish shoals and to better understand what constitutes healthy fish populations … which can be implemented by policymakers to better monitor and improve conservation of fish stocks,” commented Ron O’Dor with the Census of Marine Life, an organization that plans to catalogue marine species and populations across the oceans by 2010. If we could turn back the clock about 200 years, one could watch as millions of whales swam along their migration routes. Around 150 years ago, one could witness bison filling the vast America prairie or a billion passenger pigeons blotting out the sky for days. Only a few decades back and a million saiga antelope could be seen crossing the plains of Asia. 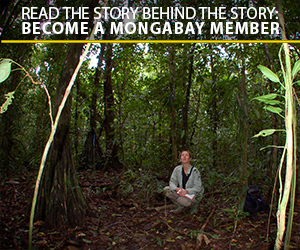 Discovering a new species can be the highlight of a biologist’s career. Yet once a species enters the formal literature, complications may develop. The systen has been especially problematic because for centuries biologists have lacked the tools to construct a full and flexible list of the world’s innumerable species. Using the Internet and hundreds of scientists around the world, the Census of Marine Life is attempting to take on this monumental task. Building on last year’s first-ever successful stocking of river herring in the Bronx River, an estimated 400 additional fish were released today in an ongoing effort to establish a breeding population of these native fish in one of the nation’s most urbanized waterways. The release, which took place on the grounds of the Bronx Zoo, is part of a partnership among a diverse group of officials, biologists and citizen’s groups to restore the Bronx River, the only remaining fresh water river within New York City’s borders.